What's the first thing that comes to mind when wasting water ? 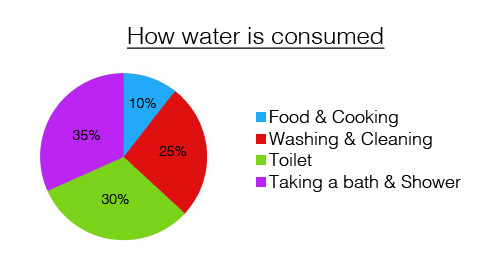 As a Canadian, I can tell you that we rank 2nd highest water consumers per person in the world. Something that doesn't make me too proud as a Canadian. America being the 1st water consumer. Saving water should be a priority for everyone no matter where you live in the world.Like anything else,we should always use things in moderation. If we compare, we consume 25% more water than the Australians and 2 1/2 times more than the Germans. The abundance of water and the false impression of it being free might explain this. Every little gesture we do, no matter how little or insignificant you think it might be can contribute greatly in the long term to not wasting water. Now of course, I am not saying you have to all deprive yourselves from taking showers or baths, or washing your cloths. There are still very effective ways on saving water when washing your clothes or taking that hot shower by following some simple Water Saving Tips. You can continue to do your everyday chores, by just following some easy guidelines that will not only save you water, but also save you money in the long run.